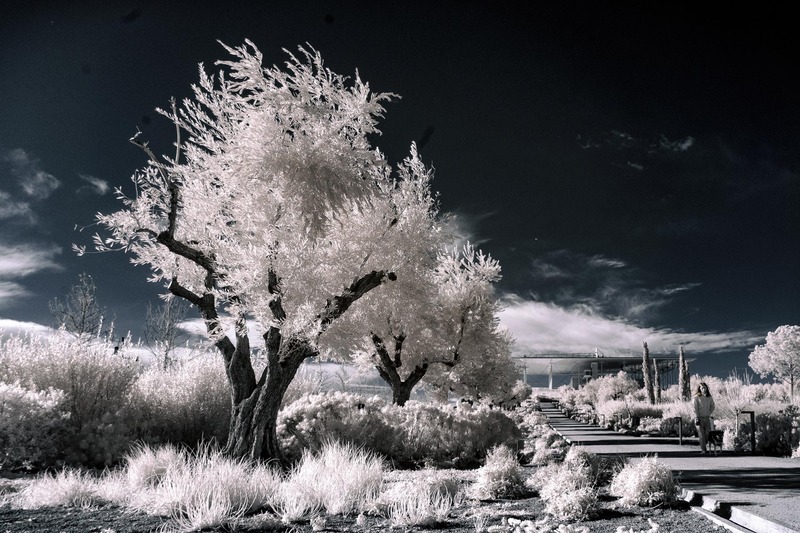 A winter infrared photo, depicting olive trees while a woman is walking down a path to the right of the frame. It has been quite a few years since I last took an infrared photo in winter. Last time I attempted it, I did it using film but the results were not good at all. Because of that, I had ruled out the possibility of doing infrared at this time of the year. Even before buying my first mirrorless camera, I was fascinated with the Sigma Art prime lenses for mirrorless. When I was using film, I would often go out with just two prime lenses; a 50mm and a 28mm. The Sigma lenses were exactly what I wanted, because they correspond to those focal lengths and they are really affordable. When I made the full spectrum camera, I intended to use the Sony kit lens for infrared. I found out that it was unusable though because it produced a hotspot in the centre of the frame. When I bought the Sigma lenses, I tested them I found that they produce a clear image. This is one of the photos I took while testing the 19mm. Olive trees are found everywhere in Greece and I have taken so many photos of them in infrared, that I knew what to expect. Still, the amount of Infrared light reflected by the leaves surprised me because of the previous poor results. I will definitely have to experiment more with winter infrared, to confirm that the results are consistently so impressive.